This book follows the global trail of one of the world’s most unremarkable and ubiquitous objects – flip-flops – from extraction of raw materials, to manufacture, distribution and consumption. 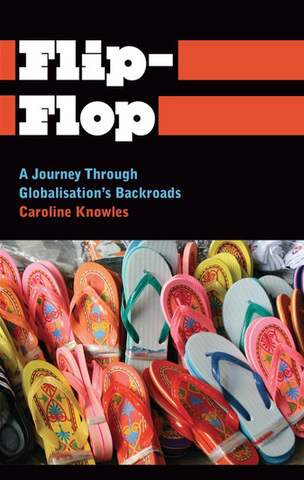 Through this unique lens, Caroline Knowles takes a ground-level view of the lives and places of globalisation’s backroads, providing new insights that challenge contemporary accounts of globalisation. The book shows that globalisation along the flip-flop trail is a tangle of unstable, shifting and contingent connections, rather than an orderly product chain. Knowles examines this instability, exploring the complexities, personal topographies and skills with which people navigate global uncertainties. In doing so, Knowles provides new ways of thinking about globalisation from the vantage point of the shifting landscape crossed by a seemingly ordinary and everyday commodity.